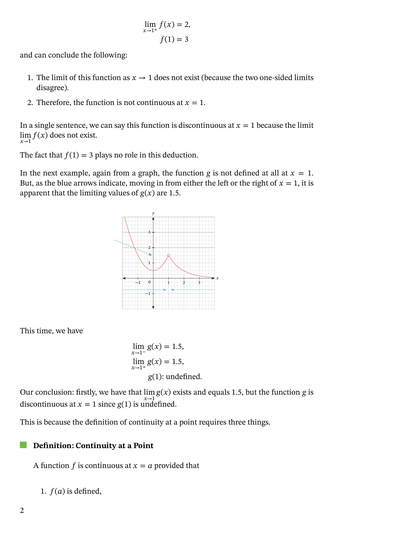 In this lesson, we will learn how to determine the continuity of a function at a point on the number line by evaluating limits at that point. Let Find the value of 𝑎 that makes 𝑓 continuous at 𝑥 = 9 . Find the set on which 𝑓 ( 𝑥 ) = √ 𝑥 + 1 4 + √ 3 − 𝑥 is continuous. 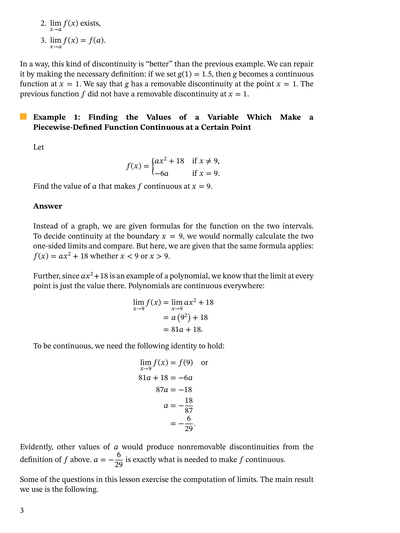 Discuss the continuity of the function 𝑓 ( 𝑥 ) = 𝑥 − 1 𝑥 − 1 6   on ℝ . Let What can be said of the continuity of 𝑓 at 𝑥 = − 7 ? Find the set of values of 𝑥 for which the function given by 𝑓 ( 𝑥 ) = √ 5 𝑥 − 1 3 is continuous. Find the set on which 𝑓 ( 𝑥 ) = 𝑥 − 2 2 𝑥 − 2 𝑥 − 6 3 2 is continuous. Use continuity to evaluate l i m s i n s i n 𝑥 → 𝜋 6 ( 2 𝑥 − 7 6 𝑥 ) . Find the set on which 𝑓 ( 𝑥 ) = 𝑥 + 9 𝑥 + 1 c o s is continuous. Given that 𝑓 and 𝑔 are continuous functions such that 𝑔 ( 6 ) = 6 and l i m 𝑥 → 6 [ 𝑓 ( 𝑥 ) − 9 𝑓 ( 𝑥 ) 𝑔 ( 𝑥 ) ] = 5 , determine 𝑓 ( 6 ) . Which of the following holds for 𝑓 ( 𝑥 ) = ( − 7 𝑥 + 3 ) + 3 5 𝑥 7 s i n ? Use continuity to evaluate l i m  →   2 𝑥 √ 2 2 + 3 𝑥 . Use continuity to evaluate l i m 𝑥 → 1 √ 3 𝑥 + 2 𝑥 − 1 5 2 . Use continuity to evaluate l i m l n 𝑥 → 5 2  5 + 2 𝑥 6 − 𝑥  . Suppose What can be said of the continuity of 𝑓 at 𝑥 = 0 ? Given 𝑓 ( 𝑥 ) = 𝑥 − 1 0 0 𝑥 − 1 0  , if possible or necessary, define 𝑓 ( 1 0 ) so that 𝑓 is continuous at 𝑥 = 1 0 . 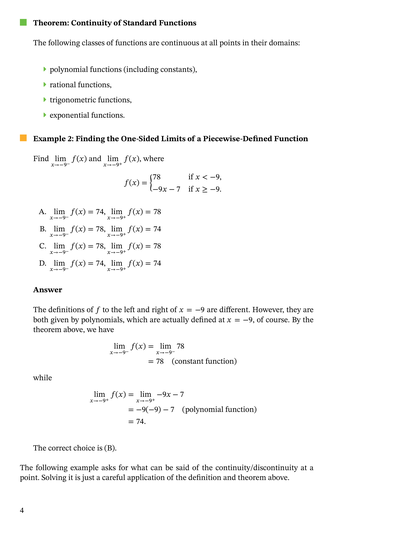 Suppose Discuss whether it is possible to define 𝑓 ( 6 ) to obtain a function that is continuous at this point. 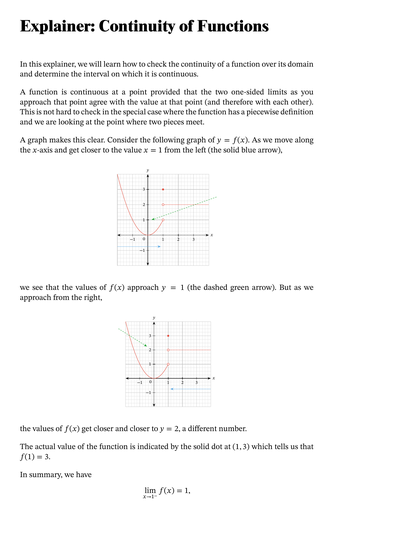 Determine whether the function represented by the graph is continuous or discontinuous. Given 𝑓 ( 𝑥 ) = − 9 𝑥 + 𝑥 − 2 2 , what can be said of the continuity of 𝑓 at 𝑥 = − 7 ? Find the set on which 𝑓 ( 𝑥 ) = 𝑥 + 5 ( 𝑥 + 8 ) s i n c o s is continuous. Discuss the continuity of the function 𝑓 ( 𝑥 ) = √ 3 𝑥 − 2 3 at 𝑥 = − 6 .